In the previous note I made a pitch for learning Boolean logic so you can solve problems with chips instead of code and suggested browsing parts catalogs to find things you’d never look for. Now, a demo of a chip I discovered by accident that solves a kerbillion problems I’ve had in the past, the 74LS259. There’s two types of chip you need to know about to understand what makes the 74LS259 great for Arduino projects. The second component to know about is the “latch”. (Say it in the Monty Python narrator voice for extra fun.) If you didn’t study EE/CS at the college level, odds are you’ve never heard of a latch. I spent 1.5 semesters doing digital logic and I’d pretty much forgotten about latches other than to remember what a pain they were to use in a circuit. The latch is one of those core functions of computers that we tend to forget about because there’s not really a software version that we use while writing code the way we use OR, AND, NOT, and so on. Simply put, a latch is a way to store 1 bit of data, and that bit’s value is either “on” or “off”. You have an input wire, an output wire, and some sort of “control” wire that lets you change the value stored in the latch. You enable the latch and capture the value on the input wire, then disable the latch and the output wire will continue to have the same value as the input wire did, even if the input wire changes value. Latches can be combined with many other chips to create memory to store bytes of data, move it around on buses, and do all sorts of things that modern computers are based on. See the connection? It’s a multiplexer with a latch on every output. To put it another way, it’s a multiplexer with memory. If you want to run 8 outputs and be able to turn them on and off independently, this is the chip you’ve been looking for. Granted, it takes 5 pins to run the LS259: 3 to generate the address, 1 to generate the on/off signal, and one to enable/disable the latch, but you gain the ability to turn things on and off and have them stay the way you left them. Another thing in the LS259’s favor is that it works just like a multiplexer, so there’s nothing new to learn and it will work with your old code with only a slight modification. You use three pins to select the address of the output pin, set your signal pin high or low, then enable and disable the latch with a fifth pin. After you toggle the latch, you can move on and set the value in the next pin. Two things this time around. The first is advocacy for learning Boolean logic, the second is an example of how to use a somewhat obscure chip to solve a common problem found in Arduino projects. If you don’t know it already, spend some time over the next few evenings learning the basics of Boolean logic. I’m not talking about binary numbers, I’m talking about the actual logic used by chips to manipulate the bits that make up a binary number. (Don’t sweat the Boolean algebra, just stick with the easy logic stuff for now.) There are a lot of basic tutorials on the net, I like this one even though it uses Comic Sans. Once you get your head around the basics, you’ll be able to solve some of your problems with chips instead of Arduino code. Here’s an example I’ve seen plenty of times in the lab: Someone is doing a simple Arduino project, and they want to read multiple switches. Maybe they have four switches and they don’t care which one is closed, only that one (or more) is closed. Or maybe they have tw switches and they only want to know when both of the switches are closed at the same time. If you’re unfamiliar with Boolean logic, you’re probably going to put each switch on its own pin then try to read them in some clever fashion in your Arduino script. Alternatively, you could use a chip that implements Boolean logic, wire your switches to that, then wire the chip to your Arduino. In the first case, where you have four switches and you don’t care which one is pressed, you could use a chip that implements “OR”, like the 74LS32. It has 4 OR gates, each with two inputs. Hook two switches each up to two of the OR gates, then hook the outputs of those two OR gates to a third, and the output of that to a single pin on your Arduino. You’ve just implemented, “if switch1 or switch2 or switch3 or switch4 then true” in hardware instead of trying to write a clever Arduino script. You’ve also used only one pin on the Arduino instead of four, which can be a really big deal on complex projects. In the second case, where you want to know when both switches are closed, you’d hook them to a “AND” gate and run the output of that to your Arduino. In this case, you’ve implemented “if switch1 AND switch2 then true” and saved yourself a pin on the Arduino in the process. Ok, so how do you find out which chip does what you want? There are endless catalogs of spec sheets on the net (hint: search for “TTL databook”) and if you go to a major component vendor or octopart you might get lucky just typing in what you want, like “4 gate OR” then look at the data sheets for the results. Also, chip vendors often produce huge printed catalogs of their chips or post PDFs on their websites. I find these useful for thumbing through while waiting on my coffee, as I often discover a chip that I would never have thought to look for but that solves some sort of problem I’ve had in the past. And now, an example of how browsing chip catalogs can be useful. First printed items: A handle for the z-axis, STL downloaded from thingiverse. I didn’t even do a calibration print, just rolled the dice to see what would happen. There’s plenty of room for improvement in terms of quality, I just need to put in some hours calibrating things. MC Supersize is concerned that in the future, people will be able to print out their own collectible toys at home for pennies instead of paying tens of dollars at a store. ..which was a Commodore C64 with monitor, printer, and *floppy drive*, even. No more sharing the Radio Shack Model 1 Level 2 at school, I could write D&D and Morrow Project character generators to my heart’s content. It was amazingly expensive relative to our other household expenses at the time, I think my dad was making $45K a year or so while he was in the Army and the out-the-door cost of the C64 Kit was around $1200. For less than that + a few evenings of assembly, I now have my own desktop 3D printer. 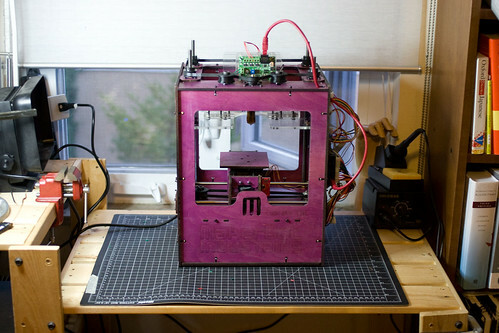 It’s basically the Altair 8800 of 3D printers, the Makerbot “cupcake”, which is based on the open source Reprap project. It only has as a working envelope of 4″x4″x6″ so I won’t be printing anything huge, and the resolution isn’t good enough for commercial resale. 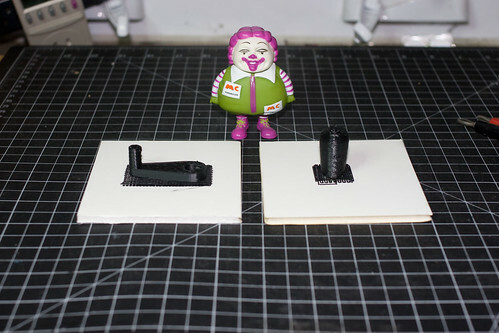 However, it’s going to be trivial to print out small objects for test purposes while doing design/fabrication projects or creating structural elements for other 3D projects. Have a ton of things going on right now, but none are finished so there’s not much to post. Mostly I’m working on an entry for the Instructables Arduino Contest, but just now my MakerBot Cupcake showed up on the doorstep. Do I risk missing the deadline for the contest in order to use the Cupcake to make something for my entry? Decisions, decisions.